U.S. Ambassador to the United Nations Nikki Haley delivers remarks to the press together with U.S. Secretary of State Mike Pompeo (not pictured), announcing the U.S.'s withdrawal from the U.N's Human Rights Council at the Department of State in Washington, June 19, 2019. The United States has announced its official withdrawal from the United Nations Human Rights Council, saying the organization is no longer worthy of its name. She accused the council of “chronic bias” against Israel. She said the U.S.had tried for the past year to reform the council, but to no avail, adding. “Look at the council membership, and you see an appalling disrespect for the most basic rights,” she said, citing human rights abuses by Venezuela, China, Cuba and Democratic Republic of Congo. 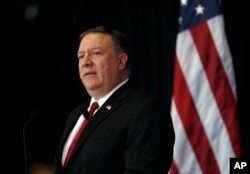 U.S. Secretary of State Mike Pompeo speaks at an Economic Club of Detroit luncheon in Detroit, June 18, 2018. Stéphane Dujarric, spokesman for U.N.Secretary-General António Guterres, released a statement in response. ​“But none of these gaps warrants withdrawal from the council, and the U.S.’s absence will only compound the council’s weaknesses,” the letter said. Salil Shetty, Amnesty International’s secretary-general, called on the U.S. to reverse its decision, while admitting that the council has its flaws. 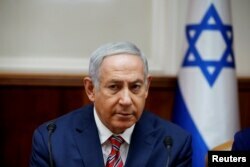 Israeli Prime Minister Benjamin Netanyahu attends the weekly cabinet meeting at the prime minister's office in Jerusalem, June 17, 2018. Phil Robertson, deputy director for Human Rights Watch in Asia, told VOA that if countries are blocking reforms, the solution is to work harder, not to leave. "The United States has allowed their myopia with Israel to blind itself to the fact that the human rights council works all around the world — on North Korea, on Myanmar, on Cambodia, on Nepal, on other countries in other places, Syria, Yemen. I mean you name it, the human rights council is a critical piece of the international human rights architecture," Robertson said. University of South Carolina political science professor Josef Olmert told VOA, "This council has become an arena for anti-Semitic propaganda for years." “The Trump administration could have left the council any time in the past 18 months, but it did not,” he said. The decision came as the U.S. is coming under increasing criticism from a number of international human rights organizations for the Trump administration's separation of more than 2,000 children from their parents at the U.S. southern border. 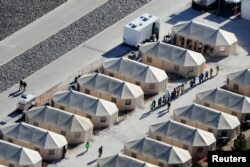 Immigrant children now housed in a tent encampment under the new "zero tolerance" policy by the Trump administration are shown walking in single file at the facility near the Mexican border in Tornillo, Texas, June 19, 2018. The U.N. General Assembly created the 47-member Human Rights Council in 2006 to replace the U.N. Human Rights Commission. Based in Geneva, the HRC is tasked with promoting and protecting global human rights and addressing rights violations. FILE - U.S. Ambassador to the United Nations Nikki Haley (R) leaves after addressing the United Nations Human Rights Council in Geneva, Switzerland, June 6, 2017. She said Washington wanted the council to remove “Item Seven” from its agenda — on the “human rights situation in Palestine and other occupied Arab territories” — which she called “scandalous” for singling out Israel for criticism. Haley also called for reforms to the body, including action to prevent some of the world’s worst rights abusers from having a seat on the council, in part by making the election process more competitive and transparent. Under the Trump administration, the U.S. has also announced its plans to withdraw at the end of this year from the U.N. Educational, Scientific and Cultural Organization, UNESCO, citing its “continuing anti-Israel bias,” and has cut its contributions this year by 80 percent to UNRWA, the agency that assists Palestinian refugees.